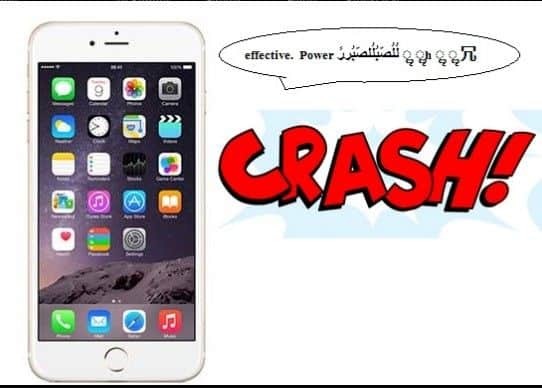 A bug in iOS makes iPhones and iPads crash and reboot when someone send a specially crafted message to the iOS users. A few Redditors have discovered a bug in iOS, which will cause your iPhone or iPad to crash or reboot when someone sends you a specially crafted message in latin script. And this bug is so badass that it won’t stop until the recipient make some changes in the settings. A Redditor Sanlansam, first posted this thread with the script which will cause someone’s iPhone or iPad to crash and he posted this. To an iphone, it restarts their phone. What’s the reason behind the crash? As soon as somebody sends a message containing the above text, it is displayed as a banner alert or notification on the lockscreen of the iPhone or iPad. The iOS then attempts to abbreviate the text with an ellipsis. If the ellipsis is placed in the middle of a set of non-Latin script characters, including Arabic, Marathi and Chinese, it causes the system to crash and the phone to reboot. But surprisingly, not all non-Latin messages can crash the iOS. According to the Reddit thread only this specific string of text to be sent within an iMessage or SMS can cause the crash or reboot, otherwise people should not have problems with no-latin messages. What’s the iPhone users’ take on it? Right now, iPhone and iPad users are using this as a prank to frighten their friends and taking it lightly, but it can be dangerous if cyber criminals take advantage of it. How to stay safe from this bug? the only working solution to fix this is making some changes in the settings and relax. Just all you need to do is to turn off the notification feature for lock screen from the settings. Go to Settings–> Notifications–> Messages–> and change to no notifications. If I turn off notifications how will I access messages? If you have an Apple Watch you can go with it and get notified, as it seems like that the Apple Watch has not been affected by the bug. However, if you don’t own one, we recommend that you turn off the notifications and check your messages manually by entering the app. Also, you can block unknown senders so that any cyber criminal don’t attack you. Will there be any permanent fix? Yes, already an Apple spokesperson has talked about it and have assured that they are already working on it and the fix will be made available via a software update. Till then, just follow these simple steps and stay safe. We will keep you updated round the clock. If you want to get instant updates on what’s happening join us on Facebook and Twitter. Previous articleWhy Sony named Xperia Z3+ (international) instead of Xperia Z4 (Japan)? Next articleGaana.com database exploit: A single hacker behind it or an organized hack?